For the second in our series of interviews with famous programmers, I interviewed Jimmy Mårdell. Jimmy has written a wide range of programs but most of you probably know him for his popular games Sqrxz and ZTetris. He is an outstanding programmer who won the 2003 Google CodeJam. Read on for the interview. Jimmy I'm 27. I've been studying computer science four years at Umeå University. However, I haven't graduated yet. I got a job offer during my studies, and decided I wanted to do something else instead for a while. That was more than 2 years ago now. Michael You won the 2003 Google Code Jam which is very impressive. Have you done any other programming since you left the TI community? Well, I program every day at work! Besides that, I've mostly been involved in algorithm programming competition, such as IOI, ACM, TopCoder and Google Code Jam. They are great fun, and also improve your programming technique quite a bit. I believe quite a lot of people in the software industry underestimate algorithm and programming technique, and focus too much on software development processes. I've also done some game programming on the Nintendo Game Boy. During my TI-time, I coded the Game Boy Color (partly in cooperation with Icarus Production and then moved on to the Game Boy Advance when it came out. I spent a year or so during my university time working on a commercial GBA game, Fila Decathlon which was developed by myself (all programming) and another guy who did the game design and all graphics. That was great fun, but I don't think I will do any commercial game developing in the future. Obviously programming is my main hobby...and in particular problem solving and similar stuff requiring analytical thinking. I also play chess quite a lot at tournament level (my FIDE rating is 2128). I work at a Swedish startup company, Elucidon. I won't bore you with what we do, but it's really cool stuff so feel free to visit our homepage for more info. I'm mainly involved with backend stuff, databases and performance optimization. I'm not that up to date with what happens in the TI community. I check ticalc.org once a month or so, but that's about it. Maybe I'm blind, but the community seems a bit lacking. I mean, people do all kinds of cool TI games obviously, but I don't see the community. I see people write a lot in the forums, but I never read those (on any site, not just ticalc.org). Lets face it; the people who have anything interesting to say don't say them in forums because they're just full of ****sh**. That's why you have news items, and editorials. Speaking of which, why isn't there a regular editorial on ticalc.org, or have I just missed it? I don't think the newsletter (which I receive) is a good substitute for that. If the forums are the community today, then I'd say it's a lot worse. Without a doubt the best thing about the community is the very reason it exist (I think): the birth of ZShell. And then it continued with Fargo etc. The whole "underground" culture was just plain cool. Also there weren't so many people doing asm programming in those days. A community that is too big isn't a real community imho. When TI started to support assembly programming, it took a bit fun out of it actually. I don't know, maybe that was the start of the decline of the community. Michael Is there one of your programs that you like best? Why? Jimmy Personally I liked Boulderdash most, because it used the exact same algorithms as the original version on the C64 (thanks to some people who reverse engineered it). 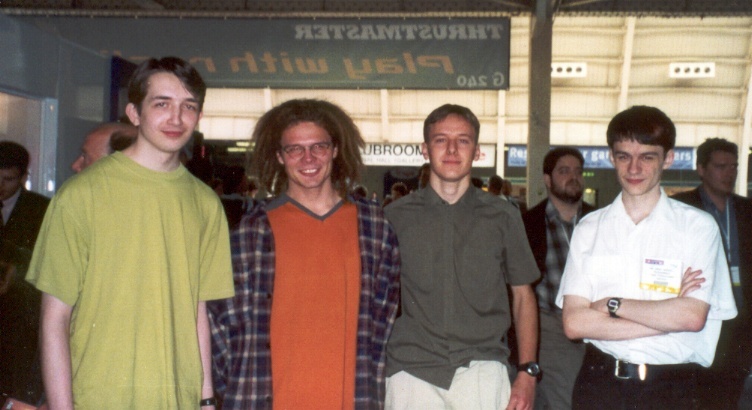 Jimmy Yes, I've met fellow Icarus Production coders Andreas Ess and Matthew Shepcar at the ECTS (a gaming convention) in London the year 2000: (from left, Matthew Shepcar, Johannes Rajala [gfx guy, but did some TI coding also], Andreas Ess and myself). Most of us still keep in touch. Jimmy Have fun when programming. Don't program because you think you must. Find enjoyment in the actual programming, not just in the finished program or game. Jimmy raised a very good point about the lack of a regular editorial on ticalc.org. This is because no one ever submits any. If you have a quality editorial, feel free to e-mail it to news@ticalc.org. > Have fun when programming. Don't program because you think you must. Find enjoyment in the actual programming, not just in the finished program or game. I agree. Don't lose hope when you've been degubbing for the past eight hours; just come back to it tomorrow or next week. Sometimes it helps to print out a section of code that's been giving you the most trouble. > just come back to it tomorrow or next week. Or continue debugging for another 4 hours. Many times, I've found, I suddenly see something obviously wrong with the code, (i.e. unconditional jumps...err...) and, upon fixing it, the program moves forward. Persistance is the key to programming. Usually, if I've been debugging for 4 hours, it's time to go to sleep. Yeah, if you've been coding or debugging for that long, it's probably better to stop and come back later. Which is one of the first things most tutorials tell you. One of my most common mistakes when writing code while tired is to put in a loop, but forget to increment the pointer/counter/whatever so the program freezes, and I spend way too much time going through the whole thing in VTI until I figure out it was a stupid mistake on my part. "[...] the people who have anything interesting to say don't say them in forums because they're just full of ****sh**." What could the "****sh**" mean? I agree. How does he even know? He visits the boards just once a month. You can't blame someone for making that assumption about forums, when 99% forums ARE indeed duckshoe. I knew I'd see you here. But why is the header 'Interview with Joe Wingbermuehle'? How do you type "å"? Re: How do you type "å"? >> How do you type å? Re: Re: How do you type "å"? How can I type "å"? But (read my account profile) I don't use Windows. Re: How can I type "å"? And for good reason too, I'm sure. Just being thorough. Oh no! I just fixed that. Probably no one here realizes that I have to make these tables by hand, copying and pasting interview responses, then some more HTML code, then my next question, then more HTML code, et cetera. It takes a while to do. Re: Re: Re: How do you type "å"? There is for most static pages on the site, but news articles do not. Perhaps you should look into using m4 to create HTML for articles. Then everything but the writing could be automated. I mean, yeah, I like M4 too, but seriously... what sane person would actually want to use it? It would save time after you finish learning how to use it. A week (more? less? I don't know how to use m4) spent to save a few hours total. Fair bargain. Ah, the FUN way of coding HTML. :D I prefer to do it that way myself, rather than an editor. I like knowing exactly what's in my code. Re: Re: Re: Re: How do you type "å"? Vim is far superior. I suggest you try it. You'll find that you can write much faster. You'll probably start using it for ASM as well as HTML. Re: Re: Re: Re: Re: How do you type "å"? I used VIM for about five seconds. Then I realized I couldn't use HOME or END, and you couldn't delete the new line character at the end of a line. Not without special key commands. Re: Re: Re: Re: Re: Re: How do you type "å"? Yeah, the main reason why I use Vim as little as possible for coding is that copying/pasting is hard, and you can't move around blocks of text (as far as I know), which I do a lot in my programs. I use cooledit instead - syntax highlighting, a menu option to run gcc on the open file, etc. Re: Re: Re: Re: Re: Re: Re: How do you type "å"? To move blocks of text: Shift-V will insert visual line mode, and then hit up/down to select a block of text, then hit d. Move where you want to put that block, and then hit p or shift-P (p puts it after the current line, shift-P) before. > Then I realized I couldn't use HOME or END, and you couldn't delete the new line character at the end of a line. For example, my file is C:\Documents and Settings\Jason\_vimrc. Note this Windows only. Linux will of course have it as .vimrc in your home directory. Vim is not bad, and I also find it useful for C. I would either Vim or Wordpad over Notepad because of their more advanced formatting capabilities, but end up defaulting back to Notepad because Vim leaves temporary files all over the place (it's supposed to delete them but doesn't a lot of the time) and Wordpad has the annoying quirk of not supporting spaces in directory names. Of course, on one of my computers, Notepad has the tendency to crash upon an attempt to save when TiLEm is running, so it's a no-win situation for me in any case. Yeah. One annoying thing about Notepad is that it doesn't know how to do line breaking correctly at all. For instance, if you're typing, most of the time when you hit ctrl-s for save, the cursor will reposition itself to some seemingly arbitrary place. Re: Re: Re: Re: Re: Re: Re: Re: How do you type "å"? Yeah, I've noticed that too. I think it has to do with the position of the mouse cursor on the document, because I've noticed that most of the time, the cursor moves to the line that the mouse cursor is on. I used to have a lot of bones to pick with Notepad. It's especially buggy when writing long files. You would think it shouldn't be that difficult to make a program as simple as Notepad work properly and support files larger than 64K. It's because of a limitation in the Win32 textbox control. A Win32 textbox used to only be able to buffer 64K. Emacs does that (creates backups, not temps tho), but you can set it to put them all in one directory. I like it that way. Plus, emacs has a psychiatrist built in if you are tearing your hair out over that one Protected Memory Violation. I write my HTML in XCode. jEdit is too slow and ugly. FrontPage has some advantages - the ability to edit/save files straight to a server is excellent (some apps emulate this through FTP but it tends to be horribly clunky and unreliable - especially on our hosting where the FTP connection gets closed every 240 seconds). Same here. No extra tags or properties or other stuff you don't need sitting all over the place.